Now your indoor cat can boldly go where he wasn't allowed before. 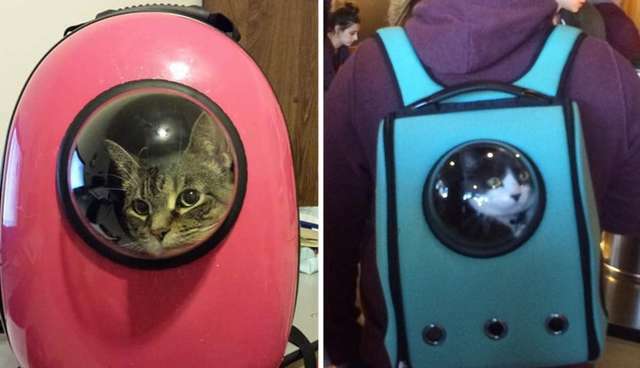 A photo has been making the rounds on social media showing a rather comical little scene: A cat in a backpack peering out through a porthole window, like a feline cosmonaut bravely exploring the wide reaches of the world beyond. Just look at him marveling over what appears to be a coffee shop full of strange inhabitants (otherwise known as hipsters). The ventilated backpack, or more aptly, catpack, in question has been generating a lot of interest - and for good reason. Even the most contented indoor cats seem to yearn for a bit of the great outdoors, but allowing them out of the house isn't always a good idea. We traced the clever pet carrier to its source, a company called U-Pet, which boasts a number of products all featuring that same bubble window design, and of course, openings to allow plenty of fresh air in. The Dodo hasn't tested these pet carriers for safety, but on Amazon.com U-Pet's products have an average customer rating of 4.7 out of 5 stars. Also, it turns out that small dogs enjoy feeling like cosmonauts, too. "The carrier is not only really cool, but very well made!" writes one reviewer. "My yorkie enjoys the bubble window and I get lots of compliments on it." "My cat is abut 18 lbs so I got the largest size," writes another. "He's snug inside but I can't stop smiling when I see his head fill up the astronaut bubble!!!!" To learn more these space-travel inspired carriers, visit U-Pet's website here.